Harold Kuphaldt (Bella Vista) & Charles Alexander: A FootLocker (Kinney) Championship Blast from the Past. In 1981 Harold Kuphaldt (Bella Vista) was not only the best in NorCal but most likely the State. Charles Alexander (St Christopher, VA) was the best for private schools but was untested against the rest. For the story (and some grainy video) check out this link. Below, the two meet up again at the 2013 Dublin Distance Classic. State Meet Finish Videos: Thanks to Bob Rush for filming and making these videos available. There is one for each race and the camera is just rolling for all the finishers. Download whatever you want. If it's not there now then come back in an hour and refresh the link, I will be upload throughout the day (it's 9 GIG of data). Hank Lawson: LYNX CLINIC IS A GO! Finish Lynx Clinic is set for Jan 11th at Los Gatos HS from 9:00-11:30 and then Real-Time practice at the All Comer meet from 12:00-3:00ish. Lynx Clinic Update #1. 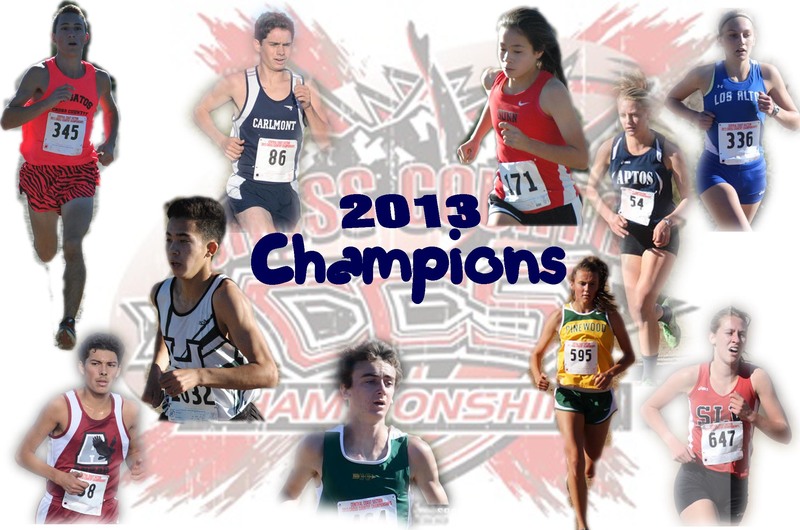 Saratoga News: Local runners to compete in state cross country championship meet. Sacred Heart Cathedral: is looking for a throwing coach for the 2014 season. The coach should have experience with shot put and discus. If interested, contact Andy Chan at achan@shcp.edu. A stipend is available. This can be a full- or part-time position depending on availability. 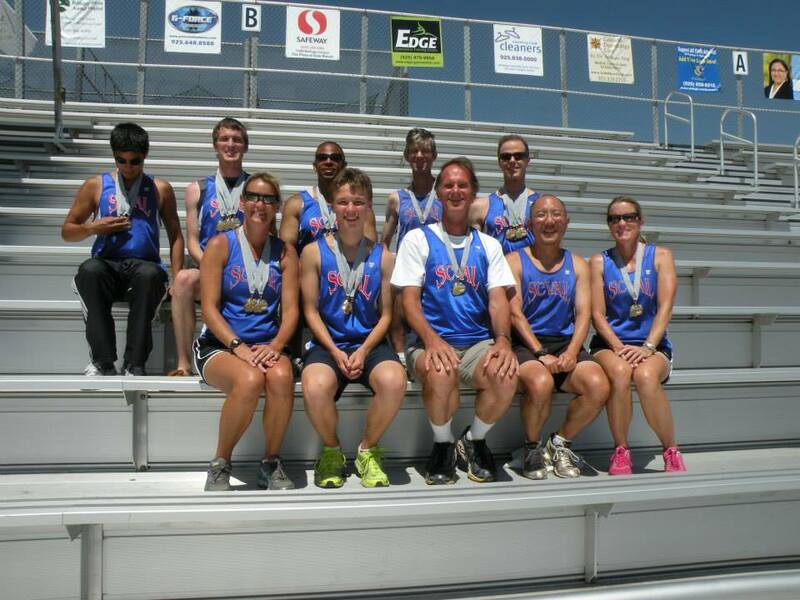 Christopher High School (Gilroy): is in need of a Asst Track coach for the Distance events for the 2014 Track & Field season. This is a stipend position. Anyone interested can contact Head Track Coach Jeff Myers at (408) 807-1694 or at jeff.myers@gusd.k12.ca.us. Los Gatos High School: is looking for a Finish Lynx Operator for the Los Gatos All-Comer Track meets this winter. It is a paid position. There will be 8 meets on every Saturday starting January 4, 11, 18, 15, and February 1, 8,15, 22 at 1:00 to 3:30. If interested or you know of a Finish Lynx Operator, please contact Willie Harmatz at 408 206-9973 or 408 354-7365. Crystal Springs All-Time list: the girls did a number on the list this year. VG Team times saw 10 additions (11 in '07 is the most) with the #2 & #3 times turned in by SLV and the #6 time turned in by Monta Vista. The adds by "Grade" had 5 adds in the Top 10 ('79 also had 5). In the 18:00 & under category there were 13 additions (17 in '79 & '11 and 16 in '07) with two girls (Maxwell & Robinson) both dipping under the 17 minute mark. Quite a year and I was kept quite busy updating the list. The 2nd Generation List has also been updated. 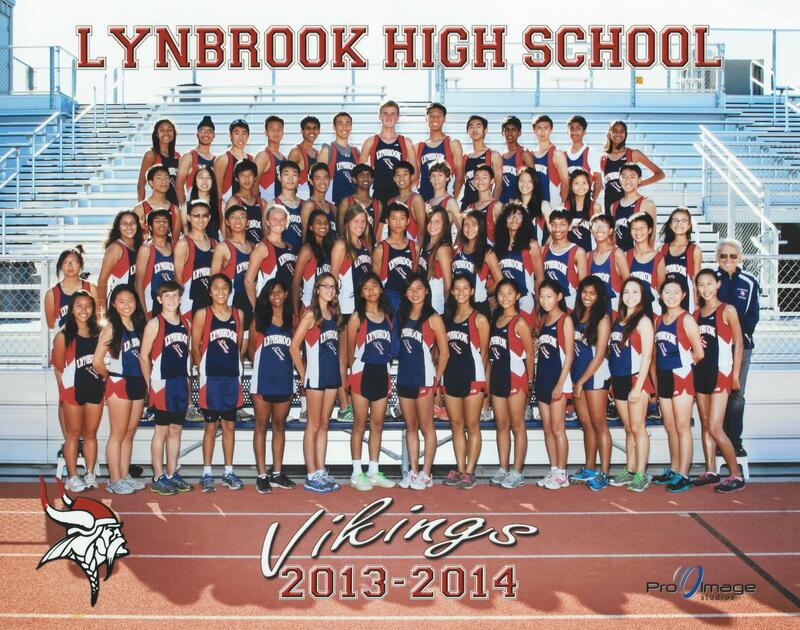 SCVAL Post-Season Meeting: on 12/02/13, a Monday, at 4:00PM at Wilcox. We will meet in the temporary staff lounge, which is near the track. 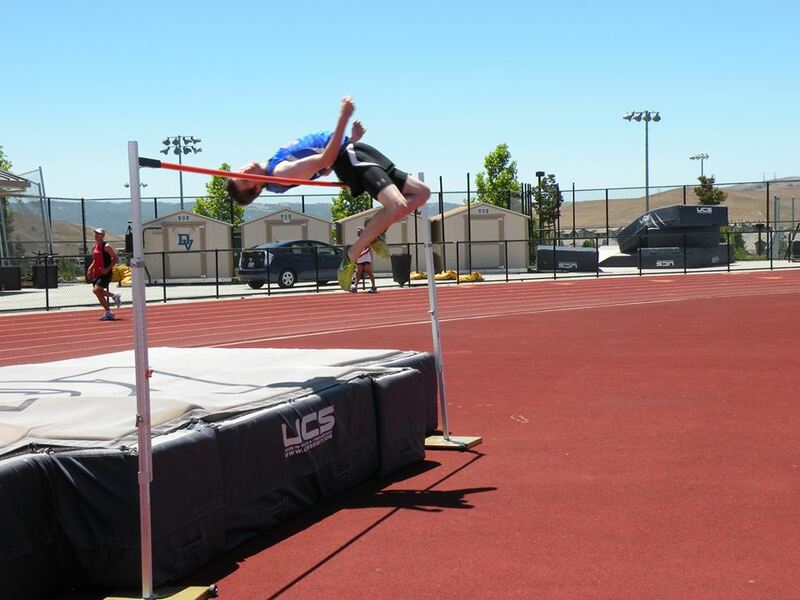 St Francis High School (Mtn View): is looking for a throws and jumps coach for the 2014 season. The jumps coach should have experience in long and triple, some high jump experience would be great. If interested, contact Mike Saso at mikesaso@sfhs or Mandy Benham at mandybenham@sfhs.com. Stipends are available. Menlo-Atherton HS: is looking for a part time Pole Vault coach this upcoming season. There is a stipend available. Email Coach Perry at aperry@seq.org if interested. Maria Kwiatkowski (Wilcox): has been named as one of the 6 female national finalists for the Wendys HS Heisman Award and will be traveling to NYC with her family to participate in Heisman Trophy Weekend with the other finalists, and College Heisman Trophy Finalists. "Virtual" CCS Meet based on League results: or CCS Estimates per Walt VanZant - enjoy. Terra Nova HS: is looking for a throws, hurdle coach for 2014 season. Practice is Mon-Fri 3:05-5:30. 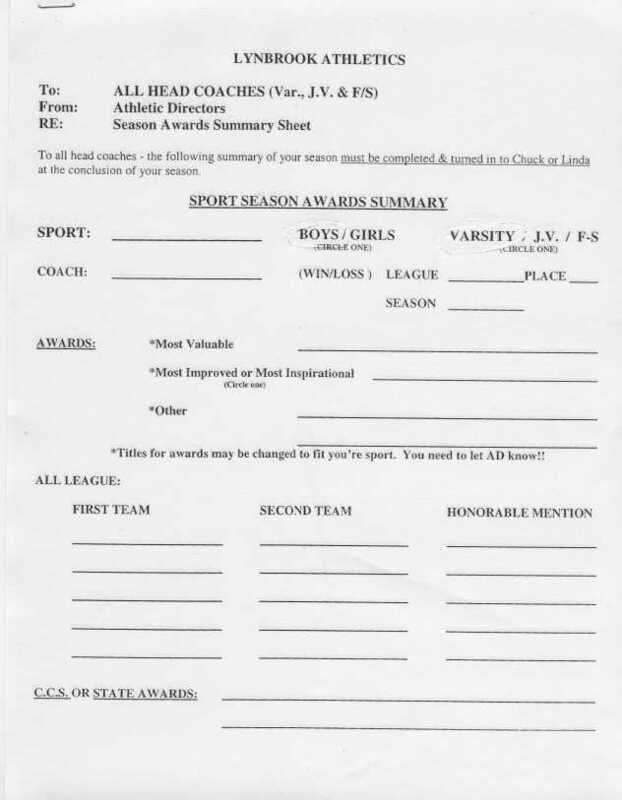 Please email Coach Bokamper Noeth at mnoeth@juhsd.net. Hank Lawson: Track Question... Coaches - Do you have a FinishLynx system and want to train your parents on how to use it, or want to learn yourself? I'm trying to find out if there is an interest in a one day Lynx class that myself and Jim Clark will teach (free of charge) if there is enough interest (6 folks needed). It would be on one of these 2 dates (Saturday, Jan 11 or Jan 18). Email me your interest (by Dec 1st) and preference of date and if I get enough folks I will contact you by Dec 3rd with the date and exact location at Los Gatos HS. It would be in the morning at Los Gatos HS and then we'd move the gear out to the track and time the All-Comer meet so you'd get lots of practice with people there to help you. You could also come back in future weeks to continue to time the All-Comer meets so by the time track starts you'd be a real pro at Lynx. Email me by Dec 1st if this sounds of interest, I would want at least 6 people in order to hold the clinic. Bellarmine College Prep: is looking to hire a throws coach for the 2014 season. Applicants should be available from 3-5 M-Th, 2-4 on Fridays, though hours are negotiable. This position comes with a stipend. Interested candidates should contact head coach Patrick McCrystle at pmccrystle@bcp.org. 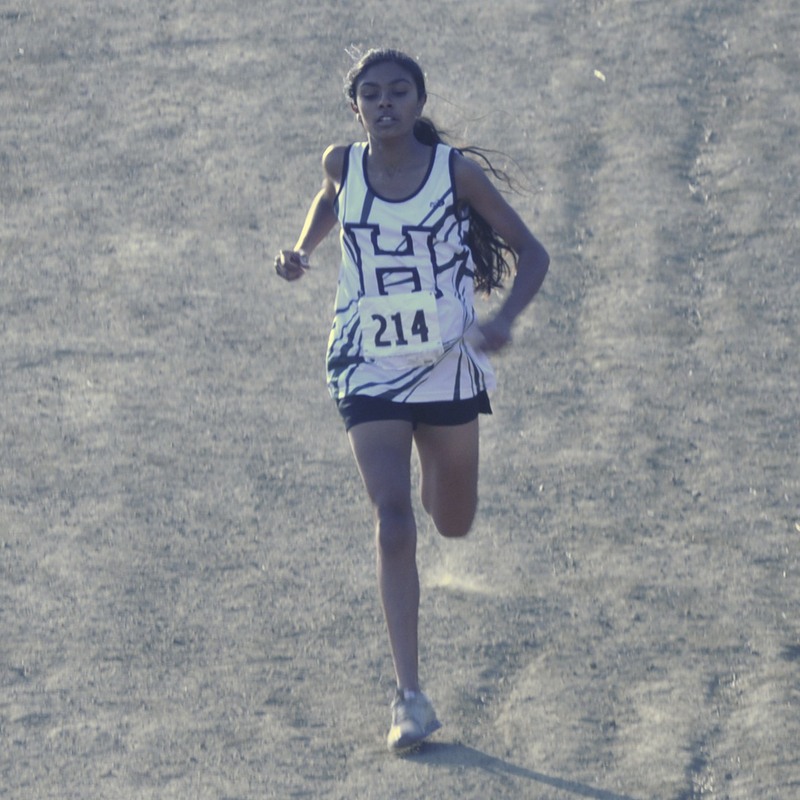 Crystal Springs #2: Niki Iyer (Harker) gets on the Crystal All-Time list with a 17:53 finish at the Crystal Center Meet. 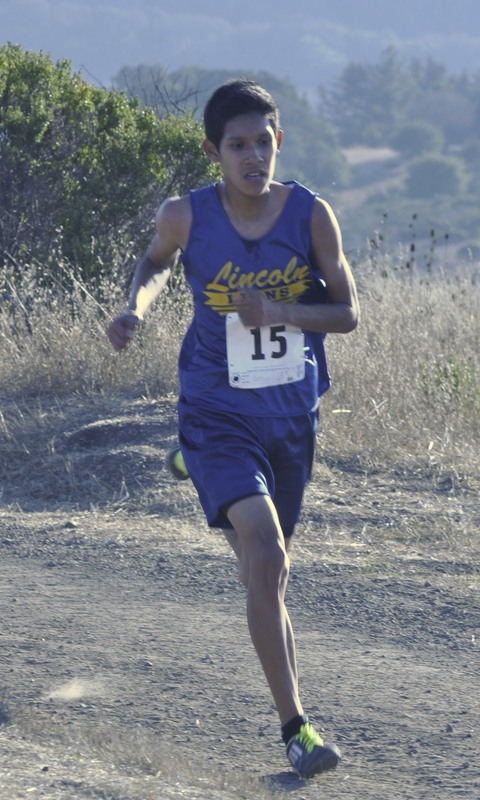 Jose Pena (Lincoln) runs 15:32 while winning the Varsity Boys race. Monta Vista High School (Cupertino): is looking for a long- and triple-jump coach for our 2014 track season. We have a brand new jumping facility, and a big group of jumpers that have been well trained the last two years (our prior coach is back in grad school). If you only have a few days a week available, that's OK, come in for skill training a couple of days a week, the other coaches can cover the fitness training days. This is a paid position, but you won't get rich--you will have fun, it's a good group of athletes and coaches! contact coachflatow@gmail.com. Pumpkin Festival 5K&10K: in Half Moon Bay. Crazy day at the Festival with waaaaay too many people but the races were lots of fun. Octoberfest 5K: Jose Pina (Lincoln) wins the Octoberfest 5K in downtown Campbell for the second year in a row. Clovis Invite: Big break through for the Lynbrook Boys at Clovis. Beating Los Altos & Homestead in the combined scoring, only St Francis finished ahead of them from CCS. Montgomery Hill Park (Boys): records have been updated thru 2012. Girls here. NorCal Jumps Clinic: To be held at Soquel HS on Jan 4th, 2014. SCVAL#2: Lynbrook guys finish 1-2 (Robison-Sarathy) to lead the Vikes to the Varsity Boys win. The Lady Vikes finish 7th but hit the Auto-Qualifying mark for CCS at this early season meet. Rallye Run: Winning team of J Tai, Chris Cheung, Revanth Nagurla & Rohit Sarathy won with a score of 21 out of 37, way to go guys. Logan Marshall: Half Moon Bay runner Logan Marshall takes off after giving up basketball. Hollister High School : I am the cross country coach for Hollister high school i was wondering if you can highlight our cross country invitational next weekend and if can you update our deadline date to Thursday 19th to allow more teams to sign up. The meet is Sept 21st (Sat), here is the 2013 info - contact the Meet Director for more info. Watsonville High School : is looking for a Coach for Cross Country (could be assistant or Head Coach depending on experience) and for an assistant Distance Coach for 2014 Track season. There is now a full stipend available as the Pajaro Valley Unified School District just reinstated funding for athletic coaches. Please contact Rob Cornett through email at Robert_cornett@pvusd.net. Running For Jim: The screening for the documentary Running For Jim will take place at Menlo Atherton HS on Thursday, September 12th at 7:15pm. You may know Jim Tracy already but if you don't, he is the University HS xc and tf coach who was diagnosed with ALS 2 years ago and his girls have won 10 xc team titles. Lynbrook Time Trial: New year, new course, new course record holders. Revanth Nagurla and Evira Babin hold the Lynbrook Course Records. Woodside Priory: is looking for a Head Track and Field Coach for the upcoming Track & Field season this Spring. Candidates must have previous coaching experience or extensive experience as an athlete in sprints and jumps. This is a stipended position. Practices are everyday after school, generally beginning at 3:30 or 4pm, and meets will include weekday league meets and weekend invitationals. The team is usually around 40 boys and girls with a mixture of mostly beginner athletes with some higher-level athletes as well. This Spring, construction will be finishing up on a new track facility as well. Please contact Mark Stogner, Athletic Director, at mstogner@prioryca.org or call him at (650) 851-6107. Junipero Serra HS: is seeking applicants for the position of Assistant Track and Field Coach. The candidate must have coaching experience or a competitive background in track and field and knowledge of one of the following event groups: throws, sprints, and/or jumps (high jump, long jump, and triple jump only). Collegiate experience in track and field as well as knowledge of meet management is preferred. A competitive stipend is available. The applicant should be able to attend practices Monday through Friday at 2:45 p.m., plus Wednesday dual meets and weekend invitationals. 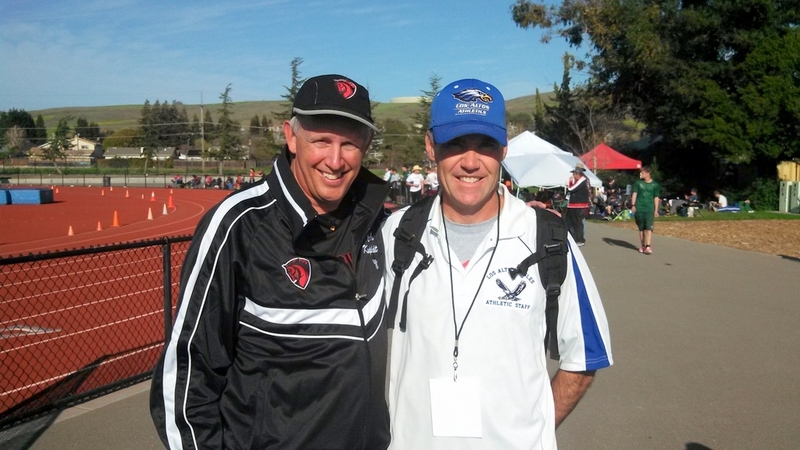 All inquiries should be made to Jim Marheineke, Head Track and Field Coach � jmarheineke@serrahs.com (650) 345-8207 x 527. Mark Greenough : Starters for cross country and track; please contact the individual starter or Mark Greenough (Mgreenough@greenoughgroup.com) to arrange for their services. Mark is the starter chair and will put out the notice. Please do this asap for both cross country and track dates. Will Scharrenberg (Mitty): Archbishop Mitty High School has an opening for the Head Coach of the Women's Track Program. If interested please contact Athletic Director Will Scharrenberg via email at wscharrenberg@mitty.com or call (408) 342-4213. SCVAL Pre-Season Meeting: on 8/20/13, a Tuesday, at 5:30PM at Wilcox. We will meet in the temporary staff lounge, which is near the track. Minutes. Summer Running: Pix can be found here. LA84 Foundation: Last free clinic of the year. The Running Summit: Distance Summit at Chabot in Hayward on Sept 21 & 22. Crystal Springs Schedule (as of 08/14/13): Check it out to see who is running when on the Crystal course. The Crystal Springs Handbook can be found here. Dan Hodgin (Mitty): Mitty is looking to host one or two schools in a VERY low key 2.1 mile scrimmage on 9/7. No uniforms, no spectators, just a practice race to kick off the season. It would have to be early to allow use of facilities. Interested coaches should contact Dan Hodgin.Dan@danhodgin.com. Monta Vista athletes: Nice article about the Throwers at MVHS. Coach Jim O'Brien (Arcadia): Firing Documentary. Carlmont HS: in Belmont, CA. is looking for a Head Cross Country Coach. This is a paid position. Must be available in the afternoon, Monday thru Friday to run practices and attend meets as well as some Saturdays. In past years the team has been very successful, winning multiple PAL and CCS Championships. Interested candidates should send their resume to the Athletic Director, Patrick Smith at psmith@seq.org. USCAA Nationals: SCVAL defends their National Title at the 36th Annual USCAA Corporate Nationals. Lynbrook alum Scott Blomquist PRs at 6-04. Summer Running Group: Open to all in the Lynbrook HS area. Dan Hodgin (Mitty): Archbishop Mitty High School is currently looking for a Cross Country assistant coach for the 2013 XC season. This is a paid position. Please contact Dan Hodgin at dan@danhodgin.com or call 408-550-6326 if interested. Who are the Top Teams & Individuals returning to CCS this year: Taking last year's State Meet results, here is how it is scored out. St Ignatius HS: in San Francisco, CA (CCS) is seeking a High School Assistant(s) Cross Country Coach. The SI program is a successful and competitive program in the WCAL and Central Coast Section (Div III). An applicant should be willing to work with the existing coaches and have a willingness to learn and contribute to help the program continue to move forward. High school practices Monday through Friday and some Saturdays. This is a paid position. Interested candidates should email their resume and letter of interest to Head Coach Nicholas Alvarado at NAlvarado@siprep.org. Palma High School : is looking for a Head XC Coach for the 2013 season. Could also be a distance position with the track and field team as well. Both of these are stipend positions. Please contact Jason Smith 831 970 1128 or email at jsmith@paraisovineyards.com. Christopher High School (Gilroy) : is looking for asst coaches with backgrounds in jumps, hurdles or sprints. These are Stipend positions. Any one interested can contact Jeff Myers at (408) 807-1694 or jeff.myers@gusd.k12.ca.us. 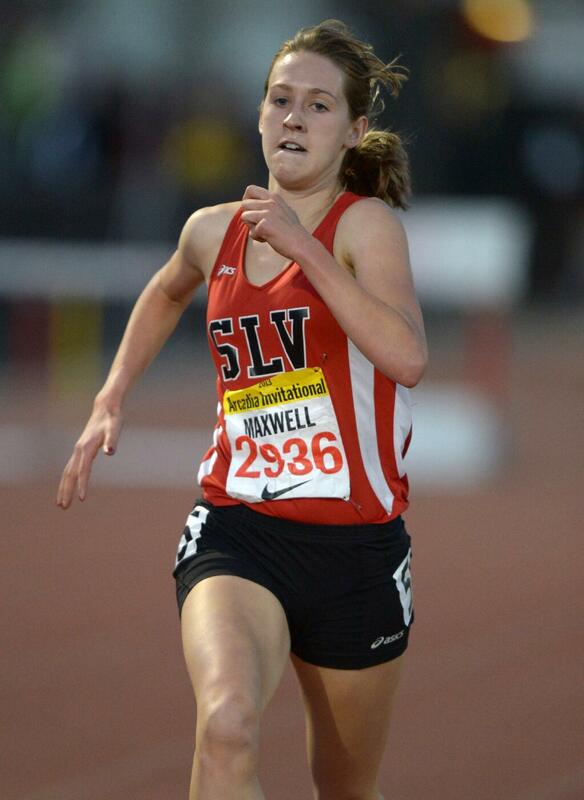 Anna Maxwell (SLV): will be representing the USA this summer at the World Youth Track Championships in the Ukraine. High Altitude Running Camp: Runners and Coaches: Please plan to join us for the 43rd Annual CTM High Altitude Running Camp & Clinic: July 29 - August 2, 2013 (Sierra Nevada Mountains, California). Bay Area Running Camp: Camp is almost full! Team discount of $50 if 5 or more team members attend camp. Email us at bayarearunningcamp@gmail.com for code. Registration includes shoes, shirt, notebook and awesome speakers. HS HJ: Some pretty amazing jumpin' by some HS Kenyan HJ'ers. Crystal Springs Summer Practices: Some runners have been practicing on the Crystal Springs course during the summer, including groups of 10 or more with their coaches. Bob Rush is going to order one chemical toilet for the summer at a cost of $255. He would appreciate that teams who practice on the course on a regular basis during the summer contribute $50 (payable to San Mateo Community College, 1700 W. Hillsdale Blvd, San Mateo, CA 94402, Atten: Joe Mangan, Physical Education/Athletics). Teams who merely practice on the course on occasion or individual runners are not being requested to make a donation. Bob also noted that coaches who bring their teams to Crystal should bring their medical kit and emergency cards. RIP Tim Keough: in 1975 Tim Keough, Rudy Chapa & Carey Pinkowski (all from Hammond HS) ran sub-9 for 2 miles (and it hasn't happened again since). Cupertino Pride: Summer Track Club. Cardinal Track Club: will host its annual Summer Track Camp from Monday, July 8 - Thursday, Aug. 8. LA84 Foundation: Is having their first clinic of the summer, and it's free (they're all free). CCS Track All-Time Top 100 additions: 101 girls got on to the list from 2013, 41 boys were added as well (updates can be made throughout the summer, just let me know). Summer "Jump" camp: is back at Bellarmine College Preparatory starting June 11 � July 19 ( six weeks camp) that will work on Jumping in all 3 jumps Monday-Thursday from 4:30-6:30. For more info you can contact Coach Bell at coachjumps@yahoo.com. Also working with those that want to go to National ( AAU or USATF). Silver Bullets: Track Team for some summer run for fun. Mike Dudley's Summer Boot Camp: Looking for something to do this summer? 2013 Track: Still looking for 2013 Track results (GWI, NON,...).